Ben Stiller, Robert Downey Jr., and Jack Black in a film written by Stiller and Justin Theroux and directed by Stiller. If you loved Zoolander, Ben Stiller’s insanely scattershot satire of the fashion industry, then chances are excellent you will find Tropic Thunder a parallel work of glimmering genius. If you are like me, however, you will not. 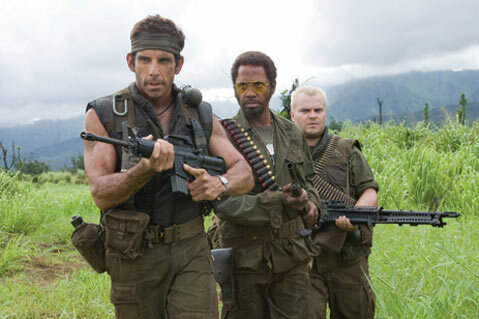 At this point in his career, Ben Stiller’s eye for cultural criticism seems trained on the mirror; the whole point of Tropic Thunder is not to question the absurdity of war movies, but to present a coyly fake send-up of his own profession. Opening with a series of wacky commercials for imaginary lowbrow culture-lampoons of actions films, hip-hop commercialism, and the hypocrisy of Hollywood art films-Thunder then slides into a parody of Hearts of Darkness which, in turn, was a documentary critique of the motives behind Coppola’s Apocalypse Now. Beyond a seeming hall of mirrors, however, the real focus of the jokes is actors and their dumb dilemmas. Stiller plays a big star whose grip is slipping, Jack Black an Eddie Murphy-like comic hooked on drugs, and Robert Downey Jr. is an Australian actor who puts himself too close to his roles. Downey’s Heath Ledger joke is actually brilliant, subverted into the more sensitively controversial ruse of playing a white man playing a black man. But the rest seems redundant. Stiller, a pathetic self-centered artiste; Black, a one-note trick pony; and Tom Cruise plays an over-weaning vulgarian with more ego than he deserves. These are not stretches. Throughout I thought of the Steely Dan lyric that goes, “Show business kids making movies of themselves.” Only these egotists aren’t kids anymore. Certainly the humor is appropriately broad, funny, and crass, and the meld of action and humor is far more seamless than Pineapple Express. And nobody says farce needs to be conscientious: consider Mel Brooks, Abrahams and Zucker (Airplane! ), or the Farrelly brothers’ constant teasing of movie conventions with fart humor and worse. But Stiller’s jokes seem readymade: male models and action heroes are easy targets. Yes, Tropic Thunder says big stars are mostly idiots, but who is dumber, the goofs on screen, or the laughing fools who bought the tickets?